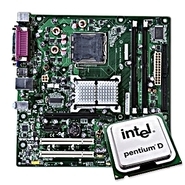 Intel - Pentium D 945 3.4GHZ D945GCNL with cpu - mATX with Pentium D 945 3.4ghz Video Snd Gigabit Lan & more! Intel - Pentium D 945 cpu fan 3.4GHZ Dual Core CPU Motherboard D945GCNL and Fan Combo. With Sound Video and Gigabit Lan. I/O Shield Included!